Here, we spotlight American expats around the globe and get their insider tips on the best places to eat and drink in their adopted cities. The Expat: Joey Passarella, the chef at Mogg & Melzer, a chic café and New York-style deli that’s a favorite among Mitte art gallery hoppers thanks to its towering pastrami sandwiches and prime location in the newly transformed Jewish Girls’ School. The New York native has resided in the Prenzlauer Berg neighborhood of Berlin for over a dozen years. What’s your neighborhood like and where do you like to eat there? The Prenzlauer Berg has changed a lot since I moved there in 2000. It used to be punk rocky, trashy and full of cheap apartments. Now pretty much every building has been renovated and it’s all very fancy. I like going to Kochu Kobu; they serve LA-style Korean-Mexican dishes. 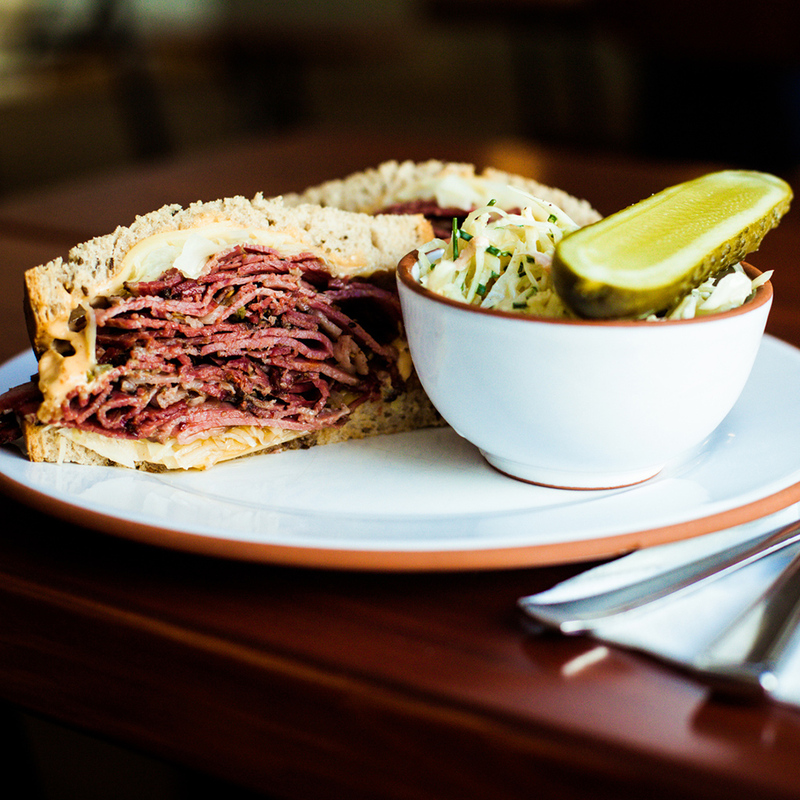 Your pastrami sandwiches at Mogg & Melzer are all the rage. How do you make them? I brine beef brisket in salt for four weeks, give it a pepper crust and marinate it in other spices overnight, then smoke it for five hours in our outdoor smoker. Then it’s steamed for another five hours. We have a classic pastrami sandwich on rye bread with some mustard that we found in Dusseldorf that’s a golden-dark brown. We also have a pastrami reuben sandwich served on rye with Russian dressing, Emmentaler cheese from the Allgäu in Southern Germany, and pickled cabbage instead of sauerkraut. What restaurant are you most excited about in Berlin right now and why? I like to go to Bandol sur mer. It’s inventive and creative and the food is amazing. The chef, Andreas Saul, is the ex-sous chef from Weinbar Rutz and he uses a lot of locally sourced products. I like his twist on cheesecake—it’s like a deconstructed, reconstructed cheesecake. What’s your favorite splurge restaurant? Prater—it’s the oldest beer garden in Berlin. They serve classic German food like really good wiener schnitzel. I like Amano Bar for really good whiskey sours with egg whites. They marinate their own cherries. What one food or drink item would you miss the most if/when you leave Berlin? Eisbein or pork knuckle. The classic dish is cured pork knuckle served with sauerkraut, yellow pea puree, potatoes and a lot of mustard. And I would have it with wheat beer. Sometimes they have it at Prater. But Altberliner Resturant by Arkonaplatz makes the best one. Ratha Tep is a former Food & Wine editor who lives in Zurich.